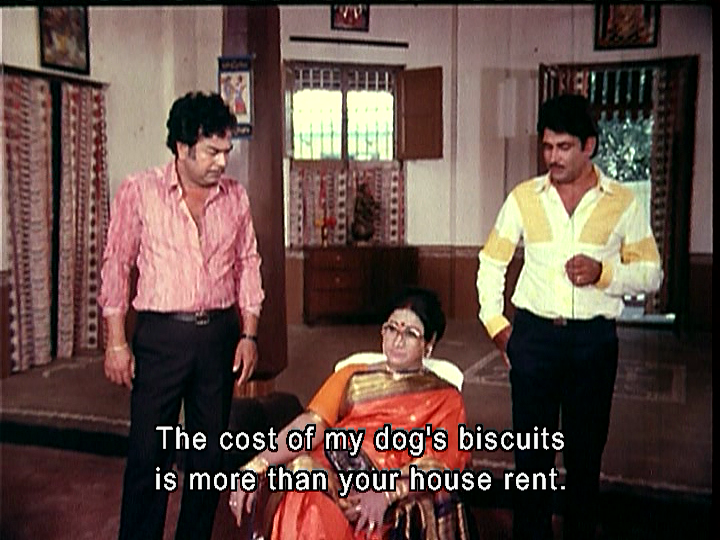 This was the first Chiranjeevi film I watched and I still totally love it. 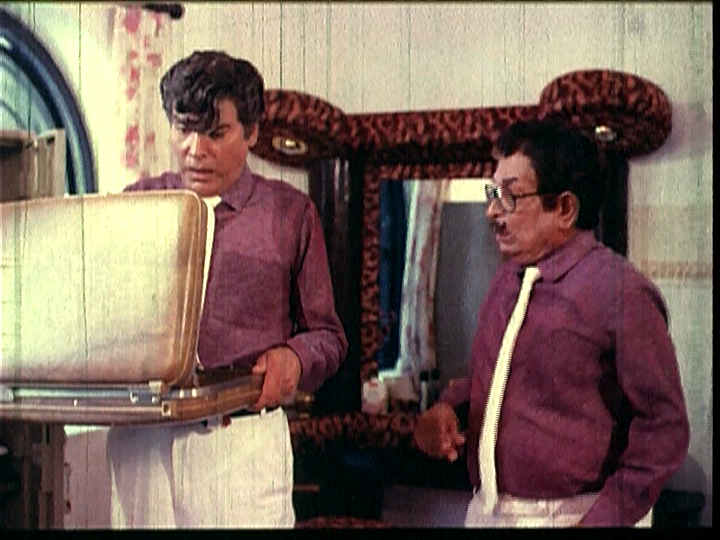 It was a hit when it was released in 1989 and was subsequently remade as Mapillai in Tamil and Jamai Raja in Hindi, but I think the original is the best. It’s a fantastic introduction to Chiru as it has some great action scenes, good comedy and of course totally awesome dancing. 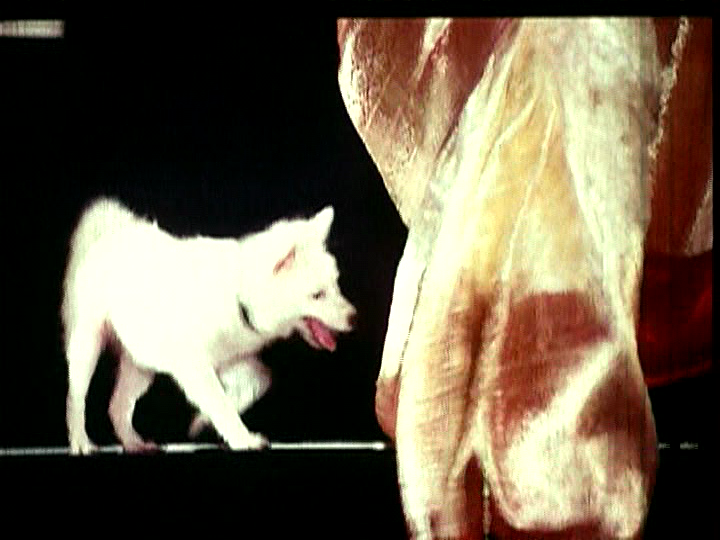 The only downside is the rather poor quality of the DVD which means that the screencaps below are rather blurry – sorry! Chiranjeevi plays Kalyan, a graduate who has come to the city to find a job. He ends up crossing paths with medical student Rekha when she points him out to the police as the man who has stolen a bride at a wedding. 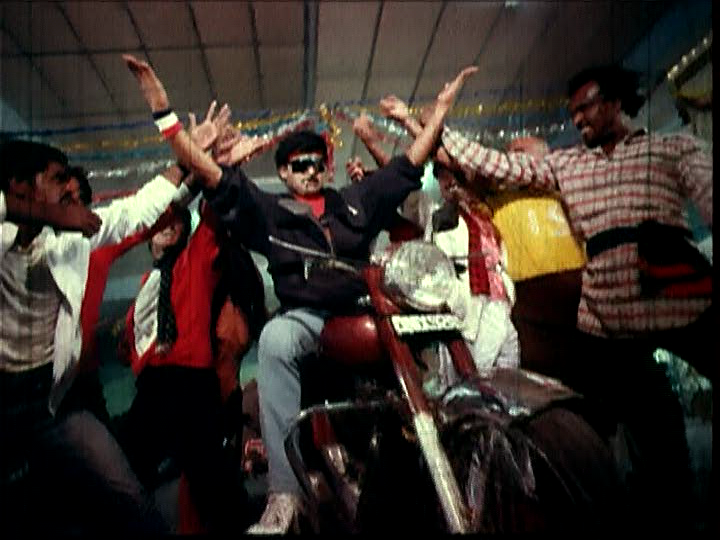 This opening sequence has some great action shots as Chiru fights on, around and over a motorbike. 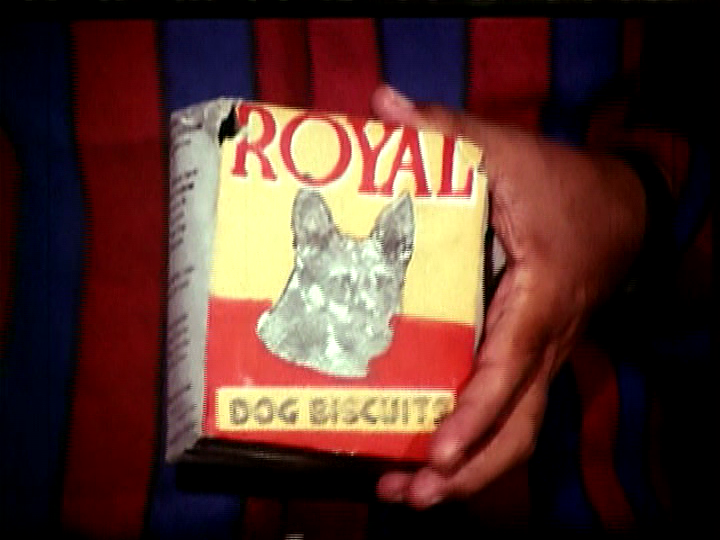 There is also some good comedy when a drunken Kalyan goes to Rekha’s hostel room to complain about her method of identifying him to the police, especially since he knows he is the good guy. 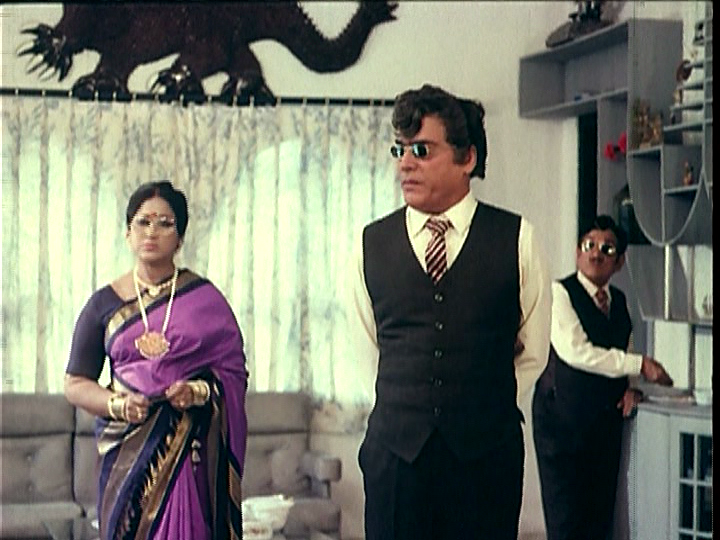 The scene is so simple but Chiru is very funny and gets plenty of humour from just one line – just brilliant! As Rekha’s eyes have been opened to Kalyan’s good qualities, in true filmi style she instantly falls in love. And once again following filmi tradition she decides that the way to win his love is to stalk him until he realises that of course he loves her too. 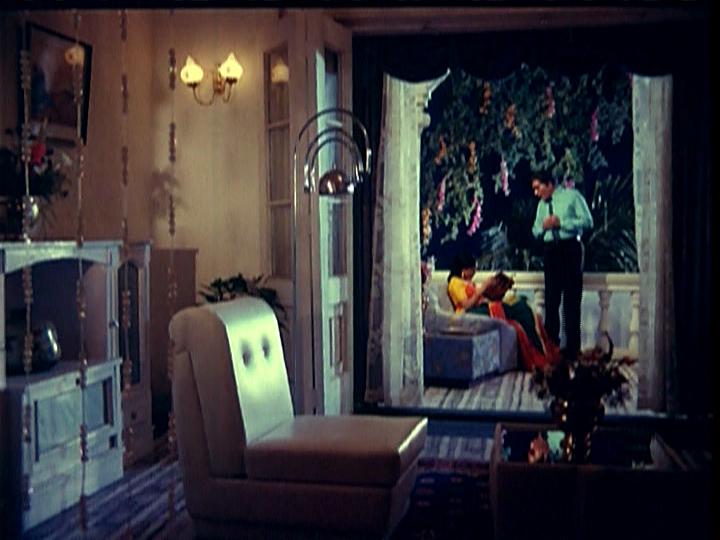 To this end she stakes out the apartment Kalyan shares with his friend Brahmam (an almost unrecognisable youthful Brahmi with a full head of hair) and finally achieves her aim of getting Kalyan to fall in love with her too despite her rather unfortunate preference for the colour pink. At which point we get this rather fabulous song which features some excellent hat choreography too . Kalyan is furious at Mrs Chamundeshwari’s attitude and initially refuses to let his sister marry Prasad, but changes his mind when he learns that his sister is pregnant. Prasad confesses to fear of his mother but decides that with Kalyan’s support he will dare to defy her, just as long as it’s all kept very secret! Kalyan also learns that his love Rekha is Mrs Chamundeshwari’s daughter, which gives him a way to exact the perfect revenge. He marries Rekha and battle lines are drawn as Kalyan and Mrs Chamundeshwari fight for control of Rekha loyalties and ultimately the fate of the rest of the family. At the same time Mrs Chamundeshwari’s crooked brother Vinayaka Rao and his sidekick Kanala have turned up to try and con whatever they can from her. Recognising a rival in Kalyan they too attempt to discredit him in Rekha’s eyes with a number of crooked schemes that ultimately all fail. Kalyan enlists his friend Brahmam’s help and along the way finds another supporter in the form of Mrs Chamundeshwari’s estranged husband. 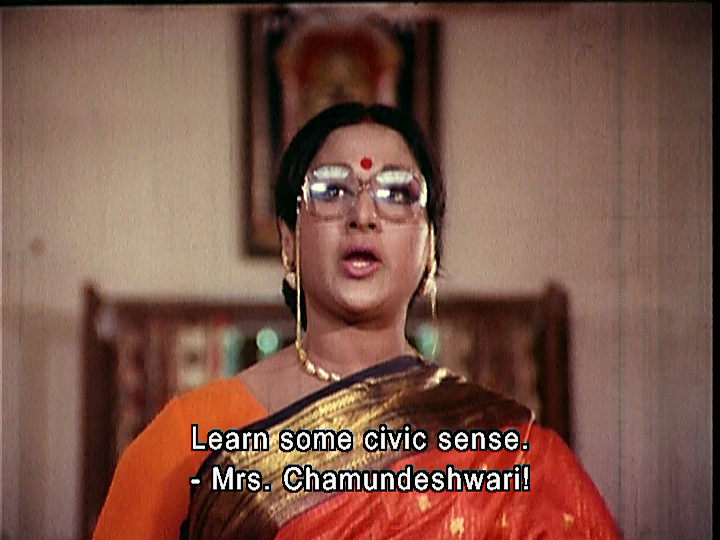 The reason I like this film so much is the excellent interaction between Kalyan and Mrs Chamundeshwari. Vanisree is fantastic as the haughty and overbearing factory owner who believes that her wealth gives her the right to make everyone do exactly as she wants. ApparentlyVanisree was a previously retired heroine who used this role as her comeback, and it certainly was a good choice. She has a lot more to do than the usual filmi mother and she exudes arrogance and distain at every step. Chiranjeevi is charismatic and charming in his role as Kalyan and gives his character plenty of compassion to contrast with the lack of feeling from Mrs Chamundeshwari. The clashes between the two are immensely enjoyable and there is a twinkle in Chiru’s eye which makes it seem as if he really enjoyed defying his mother in law at every opportunity. Of course, it could also be because he knows that he’s about to get into this outfit. The high mortal stance from Kaylan ensures that he is the good guy throughout and director A. Kodandarami Reddy is at pains to ensure that we know he fell in love with Rekha before he met her mother. It’s not just a marriage of revenge, but a true love match. 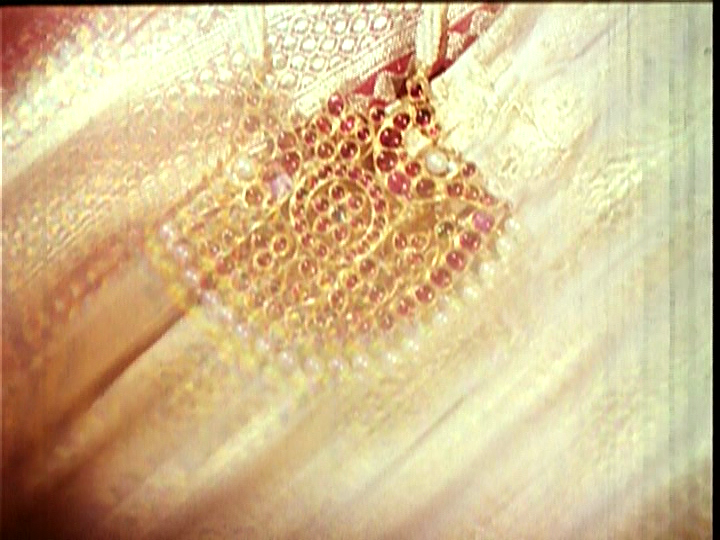 The scene depicting the first night between Kalyan and Rekha is very sweet and the story manages to mix both the conflict between Kalyan and his mother in law and the romance between Kalyan and Rekha very well. The screenplay is well written with some excellent dialogue to keep the film interesting throughout. And there is of course a twist at the end which includes some more great action sequences. Although Vijayshanti as Rekha doesn’t have a large part to play in the film after she finally wins Kaylan’s love, her early scenes are fun. 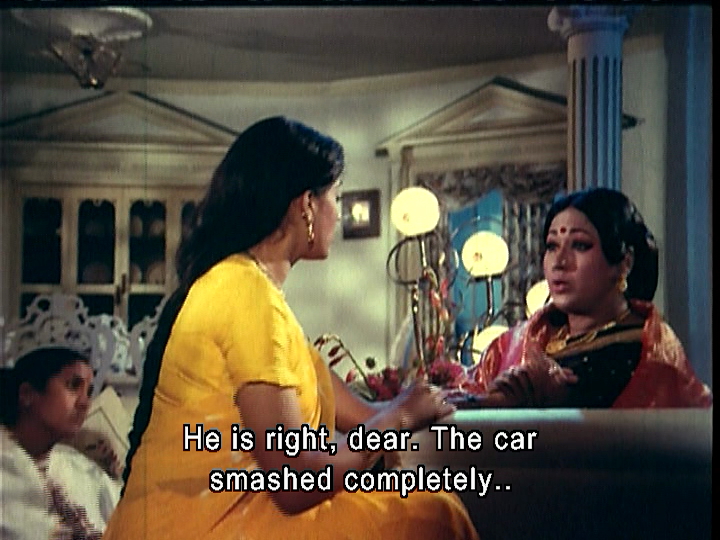 She is the dutiful sari-wearing daughter at home, but a typical young student when she goes back to the city. She changes into Western style clothes, starts smoking, and of course goes out to stalk Kalyan – all activities her mother would certainly not approve. The set design is also fab. I have no idea what this is supposed to be, but it looks as if there is a large animal with claws as an ornament above this curtain. Sadly this is as much of it as we ever get to see since I think it looks awesome. At first I thought it was a light but on repeated viewings I’m quite sure it has claws, paws and a tail! I also love this light sculpture and there is an abundance of wonderful furniture throughout the house. Just look at the animal print stand in the bedroom for example. 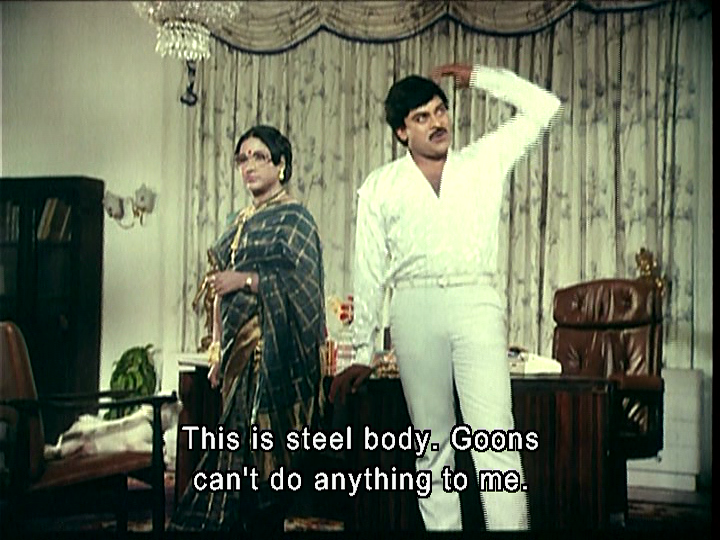 While the songs by K. Chakravarthy aren’t particularly memorable, the costumes and dancing are and Chiru and Vijayshanti look great together.I like this song as it focuses solely on Chiru with his backing dancers, although I do question the decision to make them wear these pants – they almost manage to distract me from Chiru. But only almost. It’s a great film with a good story and well worth watching for a masala mix of romance, action, drama and comedy. The cast is excellent, the dancing fantastic and the house decor is a standout. A trip back into the eighties and worth every minute. 4 ½ stars. This entry was posted in Tollywood and tagged A. Kodandarami Reddy, Allu Ramalingaiah, Attaku Yamudu Ammayiki Mogudu, Brahmi!, Chiranjeevi, Chiru, Happy Birthday Chiranjeevi, K. Chakravarthy, Megabirthday2011, Raogopalrao, Vanisree, Vijayshanti. Bookmark the permalink.